« Have a Safe Trip Home? “I am almost to the point of laying my first area of track and wondered if I need to glue it as well as pin it down? Someone told me I only needed to fix it directly to the board. I’m using 12mm thick marine ply. If I need glue – what should I use? Use the COMMENTS link to add your thoughts. The ASK A QUESTION link is under every post if you have a question you would like published. I use titebond III which is waterproof. You could pin the track and remove them later since they will not look good but I just weight the track down until it is cured. Since it is waterproof do not need to worry about it when ballasting and applying scenery. I myself have been using a glue called E6000. It is a very strong clue that will no harm most plastics is good on wood and can be removed by slipping an Xacto blade. This glue when dry is a rubber cement, so it will stretch if pulled. Do not use this on insulation foam as it will melt it. I use aileen’s Tacky glue. It’s inexpensive and easy to apply. I would recommend using cork road bed and laying the track on the cork. Again, the tacky glue is an excellent adhesive for the cork application as well. Let the glue set for at least 24 hours to ensure a secure set up,of the glue. YES, use some type of pin to hold the track in place until the glue dries? I used bulletin board stick pins to secure the cork and then the track in place. I tack the track in place first and then add my ballast and a fixative. After it is set the track is held in place very well. I like to use pins have used glue in the past but fine pins way better if you ever need to do changes to your track work. Do not ram the pins home to hard as the ballast is what really holds the track in place. Perry, the track will move though expansion and contraction. I only use pins not driven all the way to allow for this. Ballasting will also help secure the track. Perry, after laying hundreds of meters of track (HO) in my layout over the past 10 years, I have some experience to share. I used diluted white glue, nails, double sided adhesive tape and the better solution, in my point of view, is: fix the rails with nails, then spread the ballast and glue it with white glue (diluted 2 parts water, one part glue, 5% ordinary rubbing alcohol as tensoactive surface breaker). Afer the glue dries, you can remove the nails from the track getting a natural look. I have pondered the ideal of using glue however I decided to use track nails as I am using cork on plywood. The nails make it easy to position track and reposition if needed. No waiting on glue drying and weighing it down. I do have an 8 foot section of blue foam that I may glue the track down just for the experience. Sometimes Old School methods are the best and why they still exist. I am a believer in using straight PVA because of the ease with which I can pull the track up if I need to, and pins make pulling up track a painful exercise. Pins also transmit road noise down through the track to the track support, which in turn amplifies it. The only time I use pins is as a temporary measure to ensure track alignment stays as I work on getting it to sit where I want it. Some chaps actually use the ballast and glue to hold the track as a once only process. I prefer to fix the rack and ballast later. The best thing to use is small screws, this way if you want to modify your layout in future you won’t damage your track when you lift it. My solution if you’re laying track onto a solid baseboard is to use track screws. They’re cheap on line and are a dark brown colour. I place one screw every 100 – 200 in my N scale layout. It’s a simple matter to remove them to make adjustments by using a small Philips bit in your drill. I never glue track, but I understand that you may have to resort to glue if you’re laying onto foam. The best solution depends on the type of track used whether it is flex track with cork or an ez track like Kate or Bachmann. I used ez track and did not glue or pin it. Rather, I ran a bead of caulking around the track. That set it permanently in place and if I needed ever to remove any track (which of course I did ….. we all do) all you need to do is run a putty knife or a razor knife along the bead. Very simple, very effective. I prefer to tie down with thin wire going across 2 sleepers or so. It is a bit of added work as you need to drill fine holes – 2 for each “staple” created in this method. It helps to adjust the track and/or relocate them as necessary. I use track pins which seem to do the trick. In the past I have had to replace sections of track and have found this is a lot easier with pins. Gluing my ballast down also makes sure the track stays in place. I use pins. That way you can adjust the track if you need to. In my experience track can’t be lifted or altered without breaking it when its glued down. as for ballasted foam.Flexi track enables less sharp curves. My baseboard is green building foam and track bed is the “Midwest products” rubber/cork material. I use cheap dap laytex caulk and 2.5″ screws to keep the track in place until it cures. Remove the screws and glue in the ballast with 70/30 water/PVA. Now I will tell you why I choose this method, I have found that with my natural local stone ballast brings back the sound level, the laytex caulk dampens this sound considerably. Track pins and any other mechanical fastener transfer that sound deep into the baseboard making the baseboard act as a sounding board amplifying all sounds. If ever I need to remove/replace a section of track the caulk is very easy to run a knife under and lift unlike glues that need to be wet and soak to soften unless you are looking for destroyed local landscape. As you can see from the posts, there are various methods and ideas. Personally I use 1 inch foam as a board base ( to hard to get tortoise machines to throw thru 2 inches of foam. I first use a tube of Locktite for Foam Projects, to run a bead on the center line mark of my sub roadbed. Spread it very thinly and set the roadbed. I like Woodland Scenics foam roadbed for this. Split the roadbed along its center line and then put the sections together when going around curves. The sections will slip against each other as the radii are different inside and outside of the curves. The caulk grips very well and is fast drying so work along quickly and not to far ahead. No pins needed at this point. Next, I use flex track. I use very thin pins ( nails with brown small flat heads, and either drill thru the sleepers or pin right next to them along the center of the bed line. 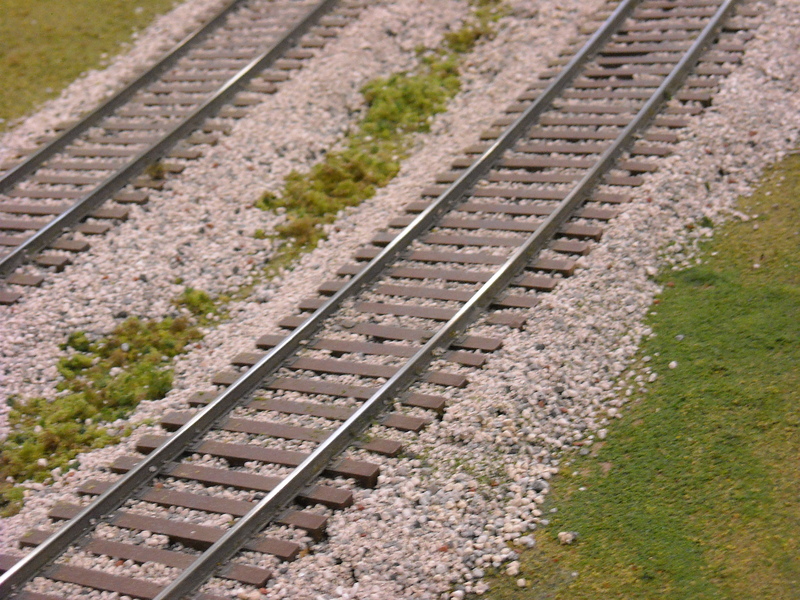 When joining track, use several pins along the first 6 inches of each end of track to give stiffness next to the joiners, try not to join track on curves to avoid kinks. If you must pin often to hold the radius. Remember to install the drop feeders at this stage too before setting the track sections. I like to solder to the underside of the rails so nothing is visable from the sides. Test everything often. A bonus is that the calk film stays plyable and very very “grippy”. The nail method of pushing them thru the subroad will grip like crazy when they hit this film. However yo can still pull them out. Finally this nailing and pinning , to some , does not look prototypical, and those “rivit counters” will then pin the track and pour isoprople alcohol and then dillluted pva over the sleepers and pull the pins. If careful, you can get a thin blade under the members and carefully move the tracks as needed. Make sure your scenery requirements are factored in before the track goes down permanently. I use both-glue and pins to hold the track down and it appears to still be holding after all these years of running trains on it. Just remember to use blue painters tape on the outside of the curves to raise the track up a little bit so it won’t derail. Best of luck and happy train running.